There are many stunning hotels in the world. As hotel addicts, we love them all—big or small, luxe or hip, expensive or cheap and cheerful. As long as someone with a good design sense has had a hand in them, we sigh with pleasure. When we saw the final images of the Morpheus Macau the sigh went on for so long, we ran out of breath. 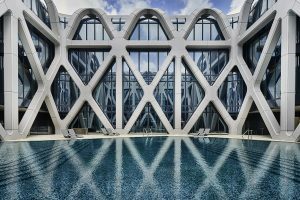 As one of the final projects of Dame Zaha Hadid—who could be called the queen of the curve—before she passed away in 2016, this 772-room hotel is a fitting tribute to the Pritzker prize-winning architect’s talent. 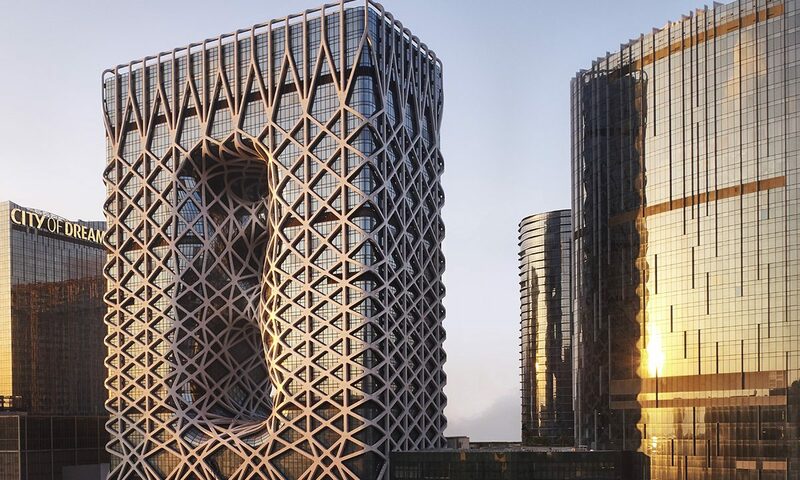 Located in Macau’s City of Dreams, a new entertainment complex in the heart of the city, the all-glass building is encased in a steel exoskeleton and seems to ebb and flow like water. This is merely an illusion, of course, but this architectural feat translates into huge open spaces inside the hotel that appear to defy logic without any visible internal structure to hold it up. 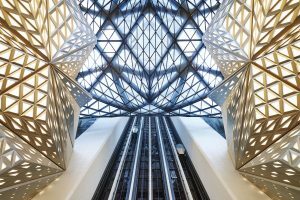 The central lobby runs the full 40 stories of the building, traversed with glass bridges that create spaces for the hotel’s restaurants and bars. 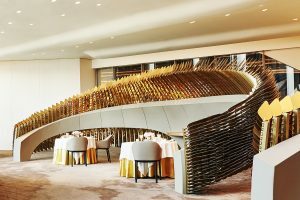 You’ll find an entire floor dedicated to the French chef Alain Ducasse, featuring the posh restaurant Alain Ducasse at Morpheus, the more casual Voyages by Alain Ducasse and the Voyages Bar. 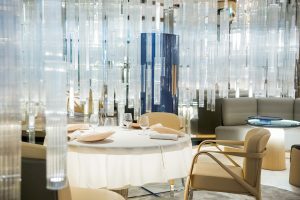 Other gastronomic goodies include a patisserie and lounge by celebrated French pastry chef Pierre Hermé and Yi—on the 21st-floor sky bridge—the only Chinese fine dining spot in Asia to serve a blend of regional cuisines omakase-style, letting you put yourself entirely in the chef’s hands. The tea sommeliers will match the eight-course menu with white, yellow, green, oolong, red and black teas. 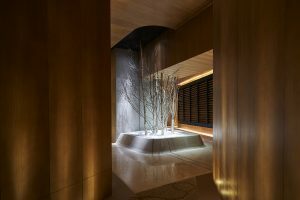 When you’re not consuming macarons and drinking tea, you can take in a treatment at the Morpheus Spa, a standout feature being the Snow Garden. While generally focused on Ayurveda treatments, you’ll find a wide range of pampering products on offer. The 40thfloor houses a rooftop pool and provides a jaw-dropping view over Macau. 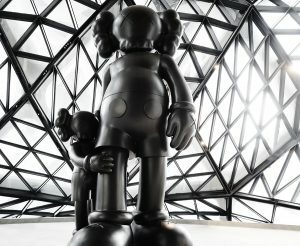 Morpheus also features 12,000 square feet of retail space, so expect plenty of luxury brands and pop-up stores promoting young designers. Also watch for the hotel’s cutting-edge art collection on display throughout the public and private spaces. All in all, this hotel is a dazzler.